Ptolemy XII Auletes was an Egyptian king of Macedonian descent. Auletes means pipes-player, referring to the king's love of playing the pipes. Ptolemy XII was also known as Neos Dionysos Theos Philopator Theos Philadelphos, which roughly means 'New Dionysus, God Beloved of his Father, God Beloved of his Brother'. He reigned during the late Hellenistic period preceding the Roman conquest of Egypt. 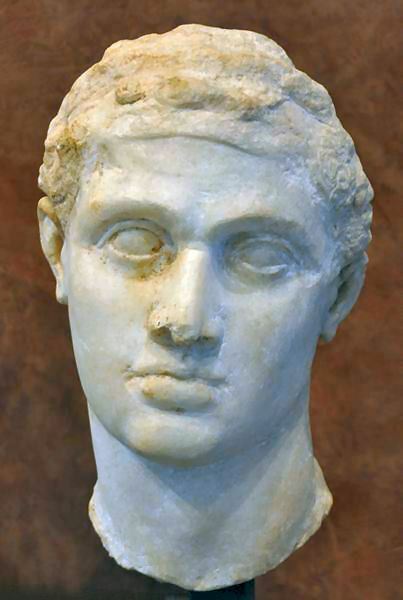 He is assumed to have been an illegitimate son of Ptolemy IX Soter, perhaps by an Alexandrian woman, or he may instead be the son of Ptolemy IX by Cleopatra IV. His reign as king was interrupted by a general rebellion that resulted in his exile from 58 to 55 BC, after which he returned and ruled until his death in 51 BC. He is generally described as a weak, self-indulgent man, a drunkard, and a music lover. Before his death, Ptolemy XII chose his daughter Cleopatra VII as his coregent. In his will, he declared that she and her brother Ptolemy XIII should rule the kingdom together. To safeguard his interests, he made the people of Rome executors of his will. Since the Senate was busy with its own affairs, Pompey (as Ptolemy XII's ally) approved the will.